On 26 July 2018, International Day for the Conservation of the Mangrove Ecosystem, we would like to share a development regarding our mangrove manoeuvre. A team of remote sensing specialists and mangrove experts in Africa have developed the highest quality and most accurate mangrove maps ever produced for Africa. The maps are directly being applied to plan mangrove conservation and restoration field projects, and serve as a basis for a ‘restoration potential’ map.The maps are produced by a team called ‘Mangrove Watch Africa’, as part of the ten year Mangrove Capital Africa programme by Wetlands International. The first product that the team produced, is a time series of ‘global mangrove extent maps’ between 1996 and 2016, based on satellite images (figure 1). These maps show changes in mangrove cover on a global scale. 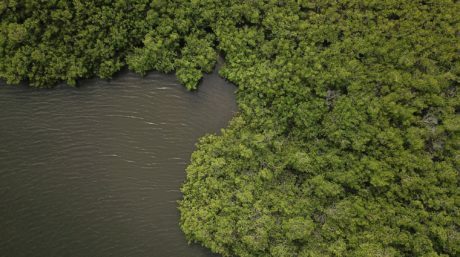 The mangrove cover maps are already being used as a basis for a ‘restoration potential map, currently under development by The Nature Conservancy and Cambridge University. Figure 1: Mangrove extent map of the Rufiji Delta in 2017. Red is mangrove area, blue is water, and green points to terrestrial ecosystem. Sentinel 2 imagery provided by ESA. Mangrove Watch Africa also developing a monitoring system using radar data (figure 2). The system will ultimately be able to provide weekly updates of the maps, which can be used to track changes such as mangrove degradation caused by illegal logging. In contrast to traditional mapping systems, it uses radar data which enables to ‘see through’ clouds. Lastly, the expert team produces maps on biomass, height, and other mangrove characteristics, which are used in the field to determine the state of the mangroves. 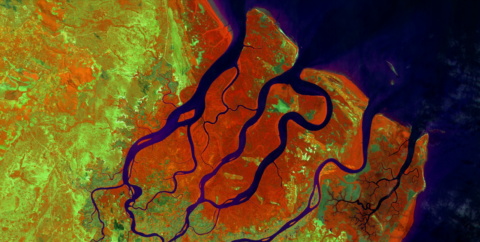 Natural colour image of the mangrove forests at the Saloum Delta in Senegal. Produced from ESA Sentinel-2 remote sensing data. 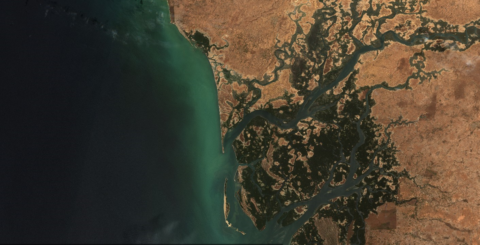 The maps are already used in two sites in Africa: The Rufiji Delta in Tanzania, and the Saloum Delta in Senegal. For example, in the Saloum Delta, the field team uses the mangrove cover change maps to identify where mangroves can best be restored. 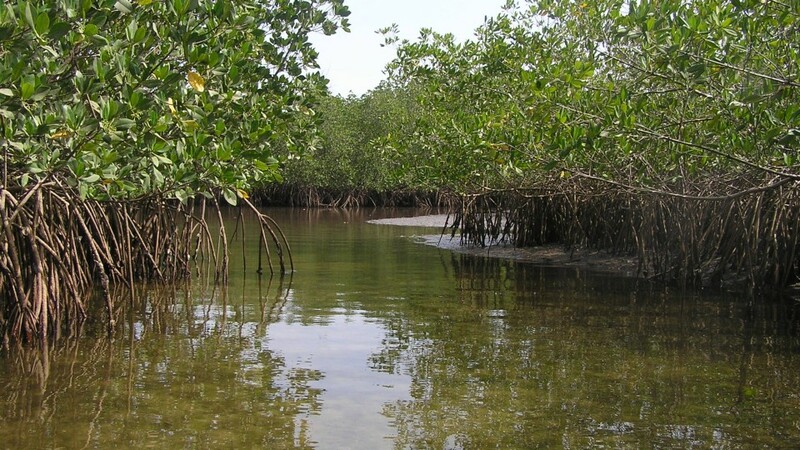 Local authorities, such as the Tanzania Forest Service, will soon also start using the mangrove extent and change maps for developing the forest management plan for the Rufiji Delta. They will furthermore use the monitoring maps to identify where illegal logging takes place, which was previously impossible due to limited resources. The Mangrove Capital Africa programme will be upscaled soon, and we will ultimately work in ten countries in Africa to protect and restore mangroves. The Mangrove Watch Africa maps will be open access! They are currently in the process of peer-review and therefore not published yet. The field team also obtains data and feeds them into the Mangrove Watch Africa team, resulting in even more accurate maps. 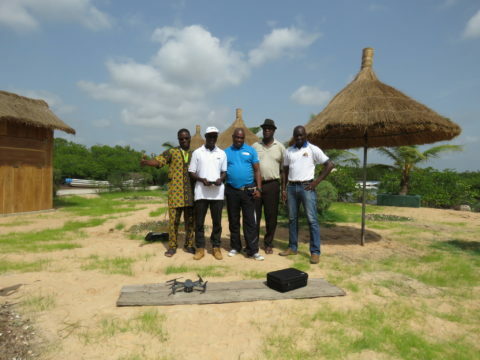 Field staff are trained in gathering data using different methods, including drones and a newly developed App. Spatial data collected with drones is extremely precise, and complements the larger scale mangrove maps, serving as a tool for validation of the satellite images. Additionally, the images are extremely suitable for monitoring (for example restoration sites). Moreover, drone pictures and videos are valuable communications materials, showing the beauty of the mangrove ecosystem from a distance. 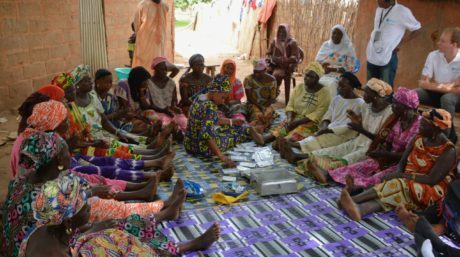 Figure 3: Some of the participants of mangrove data gathering training in July 2018 in Senegal. From left to right: Gabin Agblonon of Wetlands International West Africa, Babacar Ndao of the Centre de Suivi Ecologique, Joãozinho Sá of Wetlands International Guinea Bissau, Alioune Kane of l’Université Cheikh Anta DIOP de Dakar, Paul Moïse Diedhiou of the Direction des Aires Marines Communautaires Protégées. Mangrove Capital Africa is led by Wetlands International and financed by DOB Ecology. 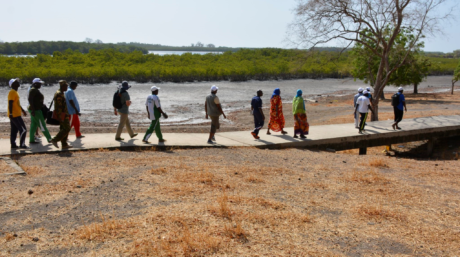 Part of the Mangrove Watch Africa work is carried out by our partners Aberystwyth University and soloEO. The data used was provided for free by JAXA (Japanese Aerospace Exploration Agency). Learn more about Mangrove Capital Africa in the Rufiji delta, Tanzania; and in West Africa (in French).